The Waving Flag: ADLG: Are There Super Armies? ADLG: Are There Super Armies? At one time or another we all must have asked this question. By super I mean an army that in the hands of almost anyone will deliver an above average number of victories. Personally, I don't think so; whatever the rules. However with Art de la Guerre (ADLG) I can answer the question in a bit more depth than with other rules. This is because there's a lot of data freely available on army choice and performance from ADLG tournaments around the world. At the moment there are the records of 13,835 games (so 27,670 armies) and I couldn't resist having a quick look. Of course it wasn't actually that quick. As I delved into the data I became sidetracked and in the end I also looked at whether army performance varies by historical period and the popularity of historical periods. The Tournament database provides an efficacy rating for each army. It covers 262 armies of the 283 provided in the rules: 21 haven't been used yet. To calculate the rating each army is awarded 1 point for every victory and half a point for a draw. Finally, the rating is expressed as a percentage of the total games played. The armies are clearly exceptional: the vast majority of armies (73.7% of 262) have a efficacy rating between 41 and 60%. However there are only two armies in the top seven which have been used in more that 25 games. This is unusually low. 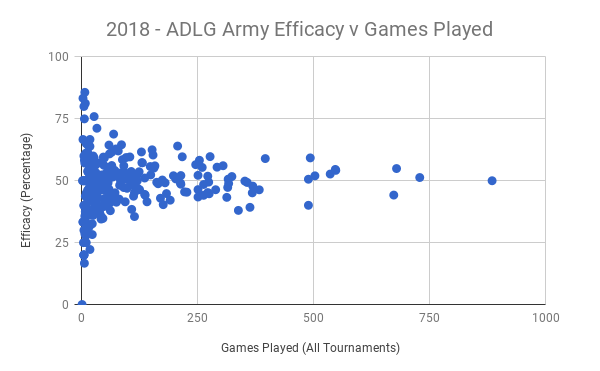 On average each ADLG army has been used 105.6 times. 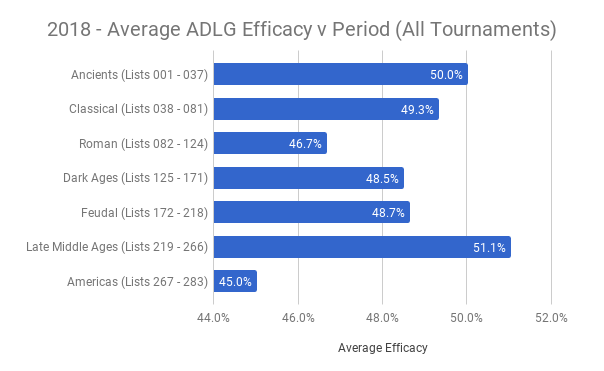 With this in mind I will leave it up to you to decide whether a place in the top seven is due to the army, the list design, the player's skill, sheer luck or a special combination of factors. Like many I have a couple of favourite periods and a few that don't interest me at all. As a result I have quite a few armies but all within my chosen periods. I began to wonder if my choice of period(s) would have any effect on my personal efficacy rating. These charts show that it might but not a lot. These give a different view of army efficacy to that in the previous section listing super armies. The first chart shows that on average most periods have very similar efficacy ratings. The second chart shows there are small, and possibly meaningful, differences. For example the average Roman period army is less effective than Classical & Late Middle Ages armies. To finish off here're some charts on period popularity. 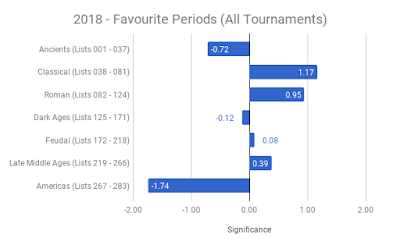 I've already used some of this data to compare the UK favourites with the Tournament favourites. Here's the basic period split with a simple statistical analysis. It's clear form both charts that the Classical period is the most popular but not significantly so and that few players have used armies of the Americas. 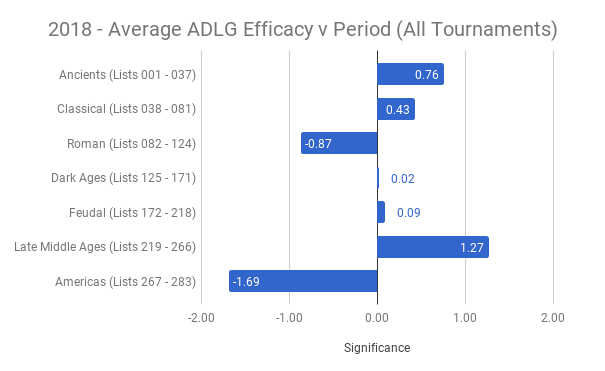 However, some care is needed in interpreting this data as themed tournaments could skew player preference. Usually what happens is when a particular army starts to dominate within a set of rules, theres two things the authors do, change the rules or the army list to nerf the problem. If its an historic list change I dont have a problem with it but when its an arbitrary change it really annoys me. FoGAM3 have done both to speed up the game and prevent lots of armies from skirmishing out the game which they could historically do by deleting lots of skirmish troops from some lists. PD did this with DBM and DBMM when things started to go wrong with his rules and lists because of a few flawed interactions and perception that some armies were just too powerful. Interesting. ADLG is currently at v3 and was published in 2014 . If the authors have done what you suggest then they have done a really excellent job as there are no super armies (as the post points out). Finally, when you say PD did you mean PB? The “it’s on its third version” argument is certainly a factor, as that also means the points system is very robust and balanced by now. However ADLG also - I believe - benefits from a set of army lists which have been expressly written with game balance in mind as well as historical accuracy. 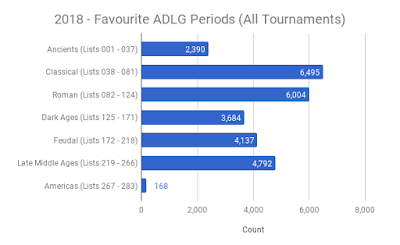 Many other recent lists for other rules appear to have been written almost entirely with “historical accuracy” as their only driver, which can lead to a lack of game balance.